We all know that the financial sector is exactly where you don’t want to be in. There are too much uncertainty on bank policies and everybody just hates the banks for doing what they do best: Trade and make money. The last three days’ sell off was exacerbated by Obama’s surprise announcement on bank policies, an attempt to restrict some of the profitable operations that banks carry on to fill their own tummies. So why are we thinking about FAS, Direxion Daily Financial Bull 3x Shares, an ETF that moves by 3 times on the Russell 1000 Financials? Banks are crap, and everybody’s going to burn them. Well yeah, that’s the current sentiment alright. But in the short term, I say again in the SHORT TERM, we have two positive signs. Rumors that the Senate will confirm Bernanke’s 2nd term as FED chairman. (I think it’s true but it’s a rumor until it actually happens.) When this becomes “news”, we’ll have some certainty which we did not have last week. There was a huge spike in volume at the last minute of Friday’s trading day on all major financials such as JPM, C, MS, GD, etc. This goes the same for most of the stocks all across the market. It makes sense because FAS is an ETF of financials under the Russell 1000 Index. Even other ETFs, and indexes show such spike in volume at the last minute. Go take a look yourself. I think a really good play would be to trade FAS on Monday with a tight stop. On Friday, FAS closed at $70.29 and was pushed up to $70.35 in the after market. Depending on what happens over night, we might see FAS open way higher than $70.35. That alone – opening above the previous day’s close – already will bring in a lot of people back into the financials under Russell 1000 Financials exacerbating an upward momentum to where FAS opened on Friday, to $76.33. Even if it opens below Friday’s close, the price move above Friday’s close could have the same effect. It could go higher than Friday’s open; however, we have those people who got in at the recent highs waiting to break even and get out. Because of those people with so much remorse, we’ll going to hit a wall. By the way, this is not the first time this type of trade happened. Check out what happened in 2009 early November. 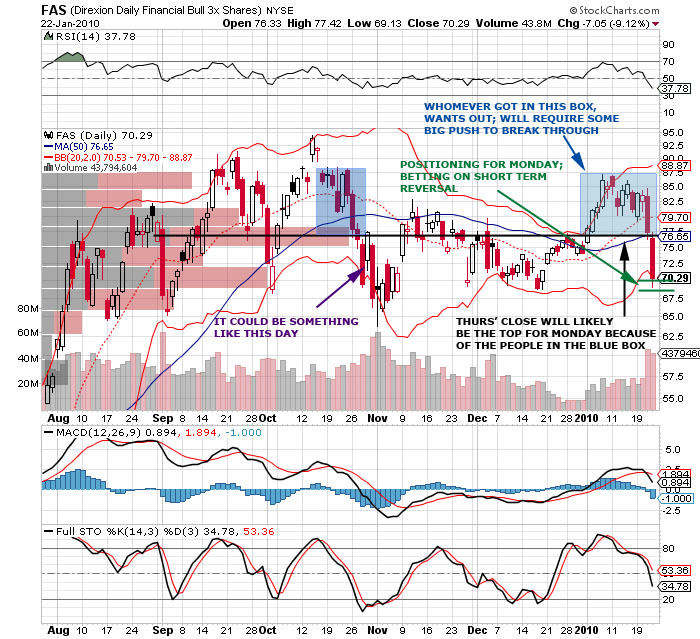 I’m thinking of entering FAS above $70.29 and putting a stop at $70.29, which is my risk, the Friday’s close. I think once the $70.29 is broken after breaking above $70.29, it will continue to go down further. Here’s a chart to help you understand what I’m talking about.